I am writing a memoir of humorous stories about my life and that of my parents. One would think that in writing a memoir, research would be unnecessary. After all, one is writing about what one knows, largely through memory. But I found, to my chagrin, that almost every line I wrote required research. Little did I know that my research would transform what I knew about my family. I could not always remember pertinent details; I could not always be sure of the facts I needed to flesh out the stories. And no sooner do you learn the answer to one question than others arise. But since I had to do research, I was lucky to be living in the Washington, D.C., area, which has abundant research facilities. My book begins in a shtetl called Piltz where my parents met and married. But I knew little about Piltz and nothing about Bendin, which my father had always pronounced "Benjean," the town to which my paternal grandmother moved after my father left Poland for Germany. Friends suggested I go to the U.S. Holocaust Memorial Museum since its computer has information on towns where Jews lived before the Holocaust. At the museum I learned that the computerized information was incomplete; it did not yet contain data on all towns where Jews had lived. I found no information on Piltz. I did find something on Bendin and learned that its Polish name was Bedzin and that it is now called Bendsburg. In the museum's fifth floor library, a staffer brought out a reference book entitled Where Once We Walked, A Guide to the Jewish Communities Destroyed in the Holocaust by Mokotoff and Sack. This work contains the names of Jewish communities and lists reference books where information on those communities can be found. I learned that Piltz has been known by a variety of other names, such as Pilica, Pilitsa, Pilitz and Pilts. One of the reference books listed, the Encyclopedia Judaica, contained no real information on Piltz. Most of the other reference books were not available in the museum library. The librarian told me where I might find some of these reference works, including the Registry of Jewish Holocaust Survivors, which is located in the museum itself. The Memorial Books Collection also contains information on individual towns written after the Holocaust by survivors and former inhabitants. In addition, the librarian told me that the library had a list of people who have done research on various shtetls. I took the names and addresses of several of those people and wrote to them. And I called the Polish Embassy. The embassy said the current name of Piltz is Pilce and gave me the addresses of government offices in Poland to which I might write for information. Embassy workers also informed me there were actually two towns called Bendin in different provinces. After conferring with family members, I concluded that the Bendin where my paternal grandmother had lived was in the province of Katowice. I wrote to the appropriate government offices in Poland. Then I received an answer from one of the people I'd written who had done research on Piltz. 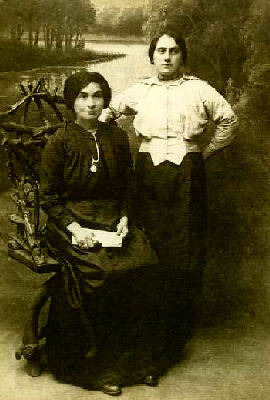 She wrote that there were actually two towns with the name of Piltz, one in Radom Province and one in Katowice Province: one came from the on-line computer service Prodigy and the other from a chapter called "On the Destruction of East European Jewry" in a book titled Kiddush Hashem, Jewish Religious and Cultural Life in Poland During the Holocaust by Huberland. In response to a letter I'd written to an official at the United States Holocaust Memorial Museum, the reference archivist sent me the listing of reference books on Piltz and Bendin contained in the introduction to Where Once We Walked. He checked those that he said were available either at the museum's Reference Desk or in the Memorial Books Collection. Reizel Pressman Fischel in Bendin, Poland. I returned to the museum library to look for a collection of books he had checked, Pinkas Hakehillot (Encyclopedia of Communities). This collection, published by the Yad Vashem Martyrs' and Heroes' Remembrance Authority in Jerusalem, will eventually document all towns in Eastern Europe where at least 100 Jews lived before the Holocaust. As of June 1990, 11 volumes had been completed, and seven more were planned. These volumes are organized along regional lines. However, the library did not have the volumes I requested, which would have included Piltz and Bendin. The librarian suggested I write to the official in charge of the Hall of Names at Yad Vashem, and I did so. He also brought me a book titled Bendin. Unfortunately, it was written in Hebrew, which I cannot read, but it contained pictures with names of residents of Bendin before the Holocaust. This book had been donated to the library by Jeffrey Cymbler of the Jewish Genealogical Society of New York. According to Cymbler, these photographs were taken from the confiscated ID cards of inhabitants of the Bendin ghetto, which was liquidated in 1943. The original photographs are at Yad Vashem. I Xeroxed copies of five pages containing 60 of these pictures of people with the last name "Pressman" or "Fischel" (the name of one of my cousins). I sent these pictures to my first cousin, Fela, in Chicago, who was born in Bendin. To my amazement, Fela called to tell me she could positively identify six of those pictures. They were members of my family, some of whom I'd never previously known about. There were pictures of Fela, her brother, my uncle and his wife, my aunt and my first cousin. In the midst of this research, on March 16 I read in the Washington Jewish Week that on the following Sunday there would be a screening at the Biograph of a movie called Diamonds in the Snow. This movie was a documentary based on the memories of three women who, as children, were survivors of the Holocaust in Bendin! One of those three women was the filmmaker Miry Reym Binford. Due to a prior commitment, I was unable to see the movie at the Biograph but did see it the following week on PBS. Meanwhile, I was off on another research quest that surprisingly gave me information on this one. My immediate family and I had arrived in New York City from Berlin via Antwerp on May 1, 1934. My recollection was that the ship we arrived on was the Red Star Line's S. S. Westernland. However, my brother thought we came on the Cunard Line. Through telephone information and my local library, I could find no current address or the phone number for the Red Star Line, so I wrote to the Cunard Line. A friend told me that the National Archives and Records Administration on Pennsylvania Avenue has records of manifests of ships that arrived in the United States since 1800. The records are not complete: not all ships are included, and not all passengers are listed on the manifests. But I decided to try anyway. At the archives I was directed to the Microfilm Research Room, room 400, where these records are kept according to the ship's date of arrival. I located a microfilm that was an index of passenger names for ships arriving on May 1, 1934. But when the film was threaded into the projector, I ran into two formidable barriers. The first was that, due to the poor quality of the microfilm, I could not make out the names. The second was that the names were arranged in alphabetical order according to the first names of the passengers. But I could not tell whether the names were arranged first by last name and then by first name or only by first name. I was expressing my frustration when a staff technician offered to help. I had been looking for the name of my brother, Hermann, since that particular microfilm ended with the letter "I." The technician asked for Hermann's age in 1934, and I gave it to him. He spent considerable time peering at the two columns of microfilm information, trying to make out the names. Then he said, "Hmm. Hermann, and he was 19 years old. I think I've got him." He had found Hermann's name and with it the page and line number on the manifest. He then secured another microfilm, of much better quality, which contained the ship's manifest. After threading that microfilm into the projector, he showed me the screen. First I saw "S.S. Westernland, Red Star Line" and then my parents' names, Hermann's name, my name, our places of birth and our last permanent residence. The manifest also contained the name and address of our nearest relative, my grandmother Udla from Bendin. The technician Xeroxed a copy for me, and a few minutes later I held in my hand a copy of the manifest from the ship on which I came to the United States 61 years ago! I hate research, but sometimes it isn't all that bad. This article first appeared in Washington Jewish Week on July 13, 1995. © 1995 by Sonia Pressman Fuentes. Ms. Fuentes is a public speaker, writer, lawyer, and co-founder of NOW (National Organization for Women). She is also the author of her memoirs titled Eat First--You Don't Know What They'll Give You: The Adventures of an Immigrant Family and Their Feminist Daughter.